Nothing spices up websites like cool sound effects (think ker-thunk as visitors press a button) or embedded videos. Think you need a programmer to add sizzle to your site? Think again. This hands-on guide gives you the techniques you need to add video, music, animated GIFs, and sound effects to your site. 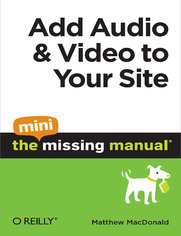 This Mini Missing Manual is excerpted from Creating a Web Site: The Missing Manual.